Iconic Woolrich plaid milled in Pennsylvania and sewn in San Francisco. Lovers of plaid, rejoice! I am a big fan of Timbuk2 messenger bags and am delighted with their new pairing with Woolrich. And while I do not need a new laptop bag (Timbuk2 bags do seem to last forever, even with heavy use), my love affair with plaid does make me desire one of these new woolen plaid options. The Timbuk2 Woolrich collection offers 3 bag types to choose from – the classic messenger, a laptop backpack, or the smaller Eula Messenger bag. Next, you choose between 2 styles of woolen plaid – iconic red and black, or the more subtle midnight (blue and grey). It’s a tough call on which bag and plaid combo would be the best. 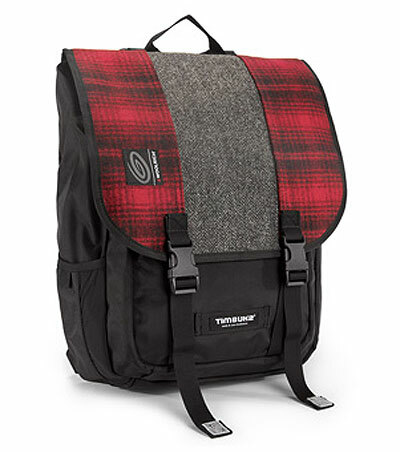 I think for me, it’s all about the Swig Laptop Backpack, pictured below in red and black plaid. Constructed of genuine Woolrich wool, rugged waxed canvas, and super durable ballistic nylon, you’ll have this classic backpack for many many years.